I recently ran into a situation that I did not fully understand when it started. Only after several weeks did I finally see how the whole puzzle was coming together. Had I jumped on the fast moving bandwagon with both feet from the beginning, I fear trouble would have ensued in the end. I was noticing, at an increasing rate, a name of a woman who seemed to be making the Christian woman blogosphere circuit with regularity. People were reading and reposting her blog at fever pitch. I had no idea who she was, but her name just kept coming up on my facebook and twitter world, and even in real-live conversations that I was having with fellow believers. Eventually, I read one of her blog posts just to see what she was all about. I really had no idea. Well, after reading the blog post, which was about a hot-button cultural issue, I had what I would call an 'unsettling feeling'. I was not on board with what she had said in the post but I could not fully explain with a rational, biblical response what bothered me about it. I did not look at anymore of her posts/publications and I left it alone. Fast forward a few weeks. This same woman came up in conversation again and I discovered that she is a pastor's wife. Being a pastor's wife is something near and dear to me, so as I listened on in this conversation, I paid closer attention and my senses were heightened. She has some amazing ideas and a wonderful heart that hurts deeply for the people God loves. Hearing that she was doing good things and people 'just love her' left me with a mixture of thoughts in my mind. She sounds wonderful and her ministry to people was touching lives. I just couldn't get the 'unsettling feeling' out of my mind and heart. In fact the unsettling only grew based on my knowledge of her role and leadership position among God's people. Fast forward again. I came upon a blog post that had a different take on some of the things this pastor's wife was saying. As I read on, I began to more fully understand why I had the unsettling feeling. As it turns out, it seems that said pastor's wife and I have some foundational differences of how God views gender roles. Knowing that gender roles is a big deal in the grand scheme of God's design for His people and if you get it wrong it affects everything, the situation really troubled me. Getting the role of men and women right (in line with the Truth of God's Word) is critical in establishing God's best for family and 'doing life' in general. No, woman is not less than man or less capable. I am not on the 'woman, take your place and be quiet' bandwagon. Yes, God sees and we must view women with equal value as men. The Truth is though, that we were designed by God for different roles. Not lesser roles. Different roles. So taking those roles and switching them or making them the same causes God's best plan for us to be skewed and has a domino effect on marriage relationships, the local church framework, work environments and family dynamics. I could go on with the whole redefining gender roles issue as there is much to discuss, but that is not the point. The point is that I should give pause and think critically about any teaching I receive from someone that has a theological difference with me on such a foundational issue. I should not jump on with both feet to the bandwagon of the most popular women's speaker making the conference circuit. I should test the waters of the most retweeted blogger. Just because everyone 'loves her' does not mean I should accept everything she says as accurate Truth. I do not claim to know everything this pastor's wife believes or positions she holds to, but what I do know (I bought the book and started reading archived posts) is that we differ in our views of biblical womanhood enough for me to not jump on her bandwagon with both feet. That 'unsettling feeling' I had weeks ago was a good thing. The Holy Spirit of God led me to see what was driving the bandwagon and I am so thankful that I did not end up some place the Lord did not want me to go. The fourth one broke the mold. Our oldest three kiddos have made life so much more pleasurable by being similar in regards to their desire to be at the dentist and actually enjoy going. The fourth one, not so much. Here's how this works.....five Linos pull up to the dentist office in our minivan stocked with a plethora of kid movies and a DVD player. I run in to get paperwork and make payments and then we get the selected movie going in the van. One by one, the oldest three take turns going into the office by themselves and have their teeth counted, cleaned, x-rayed and routinely examined. The 8, 6, and 4 year olds climb right up into the chair, don fancy shades and open wide. I sit in the van with the other three waiting for the dear hygienist to come out and give me the 'all-clear, see you in 6 months' talk. It's fabulous. We love our dentist. He has been working on Lino teeth since the 1980s. The only problem arises when the last little Lino has to go inside the office....for any reason. The restroom, to check on paperwork, to see what's happening with sister. String Bean freaks out just upon entering the building. I know what the problem is....sound. She is very sensitive to sounds. Fans in restrooms, trucks starting up, toilets flushing, air conditioners turning on, hissing pots and pans on the stove. Many things that don't faze a lot of people. So, all of the unusual sounds in a dentist office just about send her over the edge. I have yet to even get her in an exam chair - in my lap. She just covers her ears and cries. The 'I have four kids and don't have time for this' side of me says just make her sit and get it done. The 'nurturing, help me help her' side of me says I need some creative mommies to help me find a solution to get her in that chair willingly. So, if you have any ideas that can help me get my String Bean into that chair, please share. Has anyone tried special headphones? 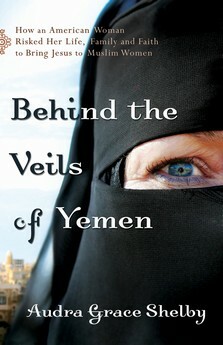 In Behind the Veils of Yemen, a female Christ follower tells of her personal experience walking with the One True God and into the lives of the Yemeni women. I originally picked it up as part of my Around the World in 80 Books Challenge because it was based in Yemen. Little did I know how much it would impact my life. I know that the Lord, in His sovereign way, brought it to my reading list more for my heart change rather than a check mark on my challenge. I am really not sure what we were thinking all along, but this new plan worked amazingly well. My college roommates and I spent the weekend in Austin catching up and relaxing. The exciting part was leaving all 12 kids at home. We usually meet with all the kids......and have a great time. It's just not very relaxing. It's a lot of work. The kids just love being together and a fun time is had by all. This time around with 'mommies only' was just what I needed. These two girls have known me for decades and we just get each other. I am not their pastor's wife. I am not their counselor. I am not their employer. I am not their crisis manager. I am their friend. I don't have to be anything else and they don't have to be anything to me. Being a ministry wife can often put me in a bubble and these two have never been on the inside of that bubble. I like it that way. I'm sure they do too. Our relationship will always be different from those in the bubble. No matter what friendships I form in the church, at the end of the day, I am always married to their pastor. I am reminded each time I talk to the roommates on the phone or see them how much I need a relationship like the one we have. It does not have expectations or requirements of me (perceived or real) and it allows me to be stretched and grow in the Lord. They love the Lord with all their hearts and want to see Him glorified in all of us. The Lord regularly uses them in my life to convict me, shape me and show me more of who He is. I am so thankful that though the miles separate us, the Lord continues to draw us close. Our time together was full of laughter, near tears, thoughtful and meaningful conversations, and no expectations for greatness. It was as treasured time and sure beyond great! We are trying to figure out how to get the three dads to keep the 12 again soon. Resurrection Sunday was fabulous today.......worshipping the risen King, family and friends for a relaxing lunch at home and now enjoying the incredible day that the Lord has made. I am so thankful for the life He has given me. Amidst the thankfulness, I have such a sense of want......wanting others to know and love the Lord Jesus with all their hearts - that they may experience the eternal life He has for them! Here are the little Linos all ready for worship - the most exciting part of our day. We are easing into some healthier eating changes around here. So far, we are doing whole wheat (homemade) bread, the whole wheat pancakes (recipe here) and wheat dough for our homemade pizzas. All of our pastas have been switched to whole wheat. I have added more fruit to our already fruit-heavy diet and eliminated some of the crackers and pre-packaged snacks that seem to disappear like candy around here. It's amazing - if you don't buy it, they don't eat it. Everyone seems to be adjusting well to the changes, but it was not a seamless transition. The whole wheat pancakes taste much better with chocolate chips instead of banana. The bread is rather dense, so you have to only eat half a sandwich and some of the littles don't 'love it'. They eat it, but could do without a sandwich if allowed. Some of the pastas made the switch without anyone knowing they were wheat. Nathan did not even recognize it a couple of times. The texture is the hardest thing for me to accept. The wheat pasta seems a little rough to me and not nearly as slimy. Vegetables are our biggest challenge. I don't like them - never have. Salads, green beans and green peas are staples that go over well in addition to a few carrots here and there. We are really lacking in the veggie department. That's next on my list. Today was a 'mommy and me' day for Samoosa. She wasn't really feeling herself so I asked if she just wanted to hangout with me while the other three were at school. A resounding yes was her answer and off we went to do what mommies do on the 'I have no kids at home today' days......bank, library, Easter dress shopping, coffee, etc. We had a fabulous day just being together - the two of us. It rarely happens so today was extra special. I was able to see more and more of who she is and what she loves. I am pretty sure today was the first time she has been through the bank teller drive thru (not ATM) because she was astounded that the lady sent a sucker back to us. I was the astounded one when she asked 'did you order my Easter dress online since that's what you do when you don't want to go to the store?' Four year olds knowing about e-commerce is just crazy. Her favorite part of the day was 'playing librarian' at the self checkout line in the local public library. The favorite part of my day was enjoying the blessing God has given me in our third precious child all to myself. She is a joy and I love doing life with her!